The core of our adult program is Kickboxing. 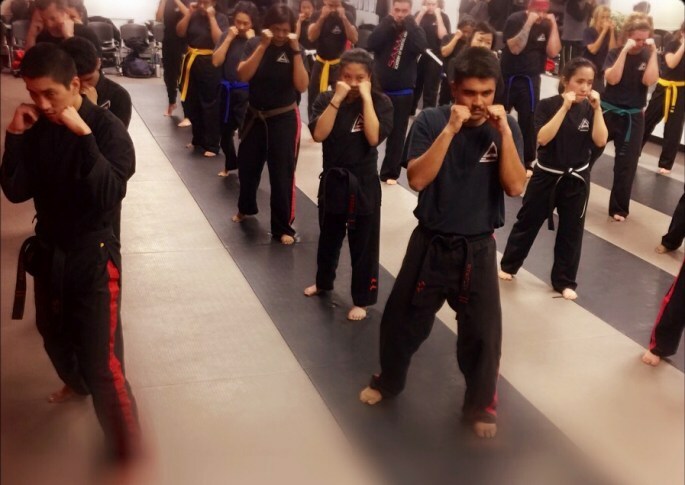 Our program focuses primarily on self-defense and body mechanics. Care is taken to ensure that all of our students are doing each technique properly. More than just your average “cardio kickboxing” class, the techniques taught are designed to maximize effectiveness and prevent injury. Impact training is a term we use to refer to heavy bag, pad and mitt-work training. It is the same equipment professional fighters use to prepare for competition. We understand that the majority of students have no desire to compete. All of the drills and modules are taught with safety as a top concern. With that said, all of the drills are designed to reinforce good technique while at the same time improving muscular strength and cardio vascular endurance. Our Kickboxing class burns up to 800 calories per class. The techniques taught are easy to learn and will take a lifetime to master. Rest assure, we teach functional martial arts applicable and relevant to today’s self-defense environment. Each class is designed to improve the three pieces of the fitness puzzle. Muscular Strength, Cardiovascular Endurance and Flexibility. The challenging and rewarding workout binds our student body together. Our experienced students are knowledgeable and encouraging. We pride ourselves on being the friendliest place in town. Whether you currently exercise regularly or have spent the past three years on the couch, we welcome you into our program. We are not interested in making judgments, just producing measurable results.